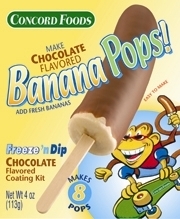 Make fresh Banana Pops in minutes. Each 4oz kit contains 12 sticks and 4 ounces of chocolate flavored dip. Kit requires 6 bananas cut in half. Just dip chilled bananas and serve immediately or store wrapped in freezer.